There are trains from Emden straight to Norddeich Mole, the ferry landing stage. From here you can easily catch the ferry over to the island. The only way to Norderney is to catch the ferry with your car in Norddeich! Or leave your car on mainland, it can assume the operation of the shipping company. Reederei Frisia leaves every one to two hours (6am to 6pm) daily. The journey takes about 50min and every DB office can provide details. Harle from the LFH flies in need traffic to Norderney. The baggage allowance is 10 kg per person; excess baggage is usually (if space available) transported up to 25 kg per person. The FLN connects regularly with the island. Norderney is otherwise accessible only by charter flight. Long and sandy beaches, open spaces and sea air make Norderney both a nature lovers paradise and a perfect retreat for those escaping stresses of the world. Queen of East Frisian Islands is the lovely nickname locals call Germanys first north sea resort. It was founded in 1797 by Friedrich Wilhelm II of Prussia. Thanks to Prince George V of Hanover it became one of the most famous bathing destinations in Europe. He made it his summer residence and many other personalities like Chancellor Otto von Bismarck followed during the last centuries. On every corner there is a rental (about 8 € ), specially at the harbout. The prices are virtually identical, the bikes also. The island is well provided with suitable paths for bicycles. A leisurely trip around the island is well doable in a day. Traffic is very little. For those interested in nature, the mudflats are a must! The National Park Centre at Port usually arrange private tour guides. Brigitte Janssen for example offers regular tours through mudflats. Most tours take place Monday to Friday. From 3 € for 2 hours. There are four supervised beaches. The west beach and the North beach are rather narrow, this reach of the city center in a few minutes. The Ostbadestrand and the nudist beach can be reached if one goes from north beach to the east. The beach is less populated and even more beautiful in the east. Modern spa facilities, a gourmet restaurant and free Wi-Fi are offered at this seaside, Thalasso-certified hotel, located a 5-minute walk from the sandy North Sea beach. Nordeney Ferry Port is a 20-minute walk away. Dating back to 1868, this historic 4-star hotel offers elegant accommodation, a charming restaurant and an inviting spa area on the beautiful East Frisian island of Norderney. 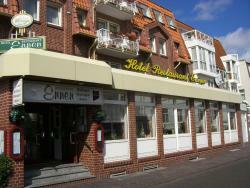 This family-run hotel is located on the North Sea island of Norderney, a 2-minute walk from the beach. Hotel Restaurant Ennen offers free use of the spa area with sauna, infrared sauna and hot tub.